IFN-producing cells (mIPCs) were absent in all lymphoid organs from ICSBP knockout (KO) mice, as revealed by lack of CD11clowB220+Ly6C+CD11b− cells. In parallel, CD11c+ cells isolated from ICSBP KO spleens were unable to produce type I IFNs in response to viral stimulation. ICSBP KO mice also displayed a marked reduction of the DC subset expressing the CD8alpha marker (CD8alpha+ DCs) in spleen, lymph nodes, and thymus. Moreover, ICSBP-deficient CD8alpha+ DCs exhibited a markedly impaired phenotype when compared with WT DCs. They expressed very low levels of costimulatory molecules (intercellular adhesion molecule ICAM1, CD40, CD80, CD86) and of the T cell area-homing chemokine receptor CCR7. ↑ "Diseases that are genetically associated with IRF8 view/edit references on wikidata". 1 2 "Entrez Gene: IRF8 interferon regulatory factor 8". ↑ Weisz A, Marx P, Sharf R, Appella E, Driggers PH, Ozato K, Levi BZ (December 1992). "Human interferon consensus sequence binding protein is a negative regulator of enhancer elements common to interferon-inducible genes". J. Biol. Chem. 267 (35): 25589–96. PMID 1460054. ↑ Nehyba J, Hrdlicková R, Burnside J, Bose HR (June 2002). "A novel interferon regulatory factor (IRF), IRF-10, has a unique role in immune defense and is induced by the v-Rel oncoprotein". Mol. Cell. Biol. 22 (11): 3942–57. doi:10.1128/MCB.22.11.3942-3957.2002. PMC 133824 . PMID 11997525. ↑ Tamura T, Ozato K (January 2002). "ICSBP/IRF-8: its regulatory roles in the development of myeloid cells". J. Interferon Cytokine Res. 22 (1): 145–52. doi:10.1089/107999002753452755. PMID 11846985. ↑ Yang J, Hu X, Zimmerman M, Torres CM, Yang D, Smith SB, Liu K (November 2011). "Cutting edge: IRF8 regulates Bax transcription in vivo in primary myeloid cells". J. Immunol. 187 (9): 4426–30. doi:10.4049/jimmunol.1101034. PMC 3197864 . PMID 21949018. ↑ Hu X, Yang D, Zimmerman M, Liu F, Yang J, Kannan S, Burchert A, Szulc Z, Bielawska A, Ozato K, Bhalla K, Liu K (April 2011). "IRF8 regulates acid ceramidase expression to mediate apoptosis and suppresses myelogeneous leukemia". Cancer Res. 71 (8): 2882–91. doi:10.1158/0008-5472.CAN-10-2493. PMC 3078194 . PMID 21487040. ↑ Holtschke T, Löhler J, Kanno Y, Fehr T, Giese N, Rosenbauer F, Lou J, Knobeloch KP, Gabriele L, Waring JF, Bachmann MF, Zinkernagel RM, Morse HC, Ozato K, Horak I (October 1996). "Immunodeficiency and chronic myelogenous leukemia-like syndrome in mice with a targeted mutation of the ICSBP gene". Cell. 87 (2): 307–17. doi:10.1016/S0092-8674(00)81348-3. PMID 8861914. ↑ Yang D, Wang S, Brooks C, Dong Z, Schoenlein PV, Kumar V, Ouyang X, Xiong H, Lahat G, Hayes-Jordan A, Lazar A, Pollock R, Lev D, Liu K (February 2009). "IFN regulatory factor 8 sensitizes soft tissue sarcoma cells to death receptor-initiated apoptosis via repression of FLICE-like protein expression". Cancer Res. 69 (3): 1080–8. doi:10.1158/0008-5472.CAN-08-2520. PMC 2633427 . PMID 19155307. ↑ Yang D, Thangaraju M, Browning DD, Dong Z, Korchin B, Lev DC, Ganapathy V, Liu K (October 2007). "IFN regulatory factor 8 mediates apoptosis in nonhemopoietic tumor cells via regulation of Fas expression". J. Immunol. 179 (7): 4775–82. doi:10.4049/jimmunol.179.7.4775. PMID 17878376. 1 2 Yang D, Thangaraju M, Greeneltch K, Browning DD, Schoenlein PV, Tamura T, Ozato K, Ganapathy V, Abrams SI, Liu K (April 2007). "Repression of IFN regulatory factor 8 by DNA methylation is a molecular determinant of apoptotic resistance and metastatic phenotype in metastatic tumor cells". Cancer Res. 67 (7): 3301–9. doi:10.1158/0008-5472.CAN-06-4068. PMID 17409439. ↑ "Tumorscape". The Broad Institute. ↑ McGough JM, Yang D, Huang S, Georgi D, Hewitt SM, Röcken C, Tänzer M, Ebert MP, Liu K (December 2008). "DNA methylation represses IFN-gamma-induced and signal transducer and activator of transcription 1-mediated IFN regulatory factor 8 activation in colon carcinoma cells". Mol. Cancer Res. 6 (12): 1841–51. doi:10.1158/1541-7786.MCR-08-0280. PMC 2605678 . PMID 19074829. ↑ Schaper F, Kirchhoff S, Posern G, Köster M, Oumard A, Sharf R, Levi BZ, Hauser H (October 1998). "Functional domains of interferon regulatory factor I (IRF-1)". Biochem. J. 335 (1): 147–57. PMC 1219763 . PMID 9742224. ↑ Sharf R, Azriel A, Lejbkowicz F, Winograd SS, Ehrlich R, Levi BZ (June 1995). "Functional domain analysis of interferon consensus sequence binding protein (ICSBP) and its association with interferon regulatory factors". J. Biol. Chem. 270 (22): 13063–9. doi:10.1074/jbc.270.22.13063. PMID 7768900. ↑ Cohen H, Azriel A, Cohen T, Meraro D, Hashmueli S, Bech-Otschir D, Kraft R, Dubiel W, Levi BZ (December 2000). "Interaction between interferon consensus sequence-binding protein and COP9/signalosome subunit CSN2 (Trip15). A possible link between interferon regulatory factor signaling and the COP9/signalosome". J. Biol. Chem. 275 (50): 39081–9. doi:10.1074/jbc.M004900200. PMID 10991940. Weisz A, Marx P, Sharf R, Appella E, Driggers PH, Ozato K, Levi BZ (1993). "Human interferon consensus sequence binding protein is a negative regulator of enhancer elements common to interferon-inducible genes.". J. Biol. Chem. 267 (35): 25589–96. PMID 1460054. Sharf R, Azriel A, Lejbkowicz F, Winograd SS, Ehrlich R, Levi BZ (1995). "Functional domain analysis of interferon consensus sequence binding protein (ICSBP) and its association with interferon regulatory factors.". J. Biol. Chem. 270 (22): 13063–9. doi:10.1074/jbc.270.22.13063. PMID 7768900. Holtschke T, Löhler J, Kanno Y, Fehr T, Giese N, Rosenbauer F, Lou J, Knobeloch KP, Gabriele L, Waring JF, Bachmann MF, Zinkernagel RM, Morse HC, Ozato K, Horak I (1996). "Immunodeficiency and chronic myelogenous leukemia-like syndrome in mice with a targeted mutation of the ICSBP gene.". Cell. 87 (2): 307–17. doi:10.1016/S0092-8674(00)81348-3. PMID 8861914. Schaper F, Kirchhoff S, Posern G, Köster M, Oumard A, Sharf R, Levi BZ, Hauser H (1998). "Functional domains of interferon regulatory factor I (IRF-1).". Biochem. J. 335 (1): 147–57. PMC 1219763 . PMID 9742224. Li W, Nagineni CN, Ge H, Efiok B, Chepelinsky AB, Egwuagu CE (1999). "Interferon consensus sequence-binding protein is constitutively expressed and differentially regulated in the ocular lens.". J. Biol. Chem. 274 (14): 9686–91. doi:10.1074/jbc.274.14.9686. PMID 10092656. Li W, Nagineni CN, Hooks JJ, Chepelinsky AB, Egwuagu CE (1999). "Interferon-gamma signaling in human retinal pigment epithelial cells mediated by STAT1, ICSBP, and IRF-1 transcription factors.". Invest. Ophthalmol. Vis. Sci. 40 (5): 976–82. PMID 10102295. Rehli M, Poltorak A, Schwarzfischer L, Krause SW, Andreesen R, Beutler B (2000). "PU.1 and interferon consensus sequence-binding protein regulate the myeloid expression of the human Toll-like receptor 4 gene.". J. Biol. Chem. 275 (13): 9773–81. doi:10.1074/jbc.275.13.9773. PMID 10734131. Cohen H, Azriel A, Cohen T, Meraro D, Hashmueli S, Bech-Otschir D, Kraft R, Dubiel W, Levi BZ (2001). "Interaction between interferon consensus sequence-binding protein and COP9/signalosome subunit CSN2 (Trip15). A possible link between interferon regulatory factor signaling and the COP9/signalosome.". J. Biol. Chem. 275 (50): 39081–9. doi:10.1074/jbc.M004900200. PMID 10991940. Nehyba J, Hrdlicková R, Burnside J, Bose HR (2002). 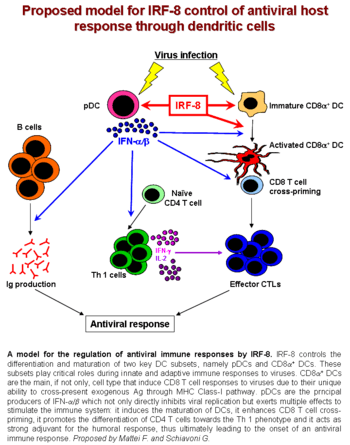 "A novel interferon regulatory factor (IRF), IRF-10, has a unique role in immune defense and is induced by the v-Rel oncoprotein.". Mol. Cell. Biol. 22 (11): 3942–57. doi:10.1128/MCB.22.11.3942-3957.2002. PMC 133824 . PMID 11997525. Zhu C, Saberwal G, Lu Y, Platanias LC, Eklund EA (2005). "The interferon consensus sequence-binding protein activates transcription of the gene encoding neurofibromin 1.". J. Biol. Chem. 279 (49): 50874–85. doi:10.1074/jbc.M405736200. PMID 15371411. Liu J, Guan X, Tamura T, Ozato K, Ma X (2005). "Synergistic activation of interleukin-12 p35 gene transcription by interferon regulatory factor-1 and interferon consensus sequence-binding protein.". J. Biol. Chem. 279 (53): 55609–17. doi:10.1074/jbc.M406565200. PMID 15489234. Barrios-Rodiles M, Brown KR, Ozdamar B, Bose R, Liu Z, Donovan RS, Shinjo F, Liu Y, Dembowy J, Taylor IW, Luga V, Przulj N, Robinson M, Suzuki H, Hayashizaki Y, Jurisica I, Wrana JL (2005). "High-throughput mapping of a dynamic signaling network in mammalian cells.". Science. 307 (5715): 1621–5. doi:10.1126/science.1105776. PMID 15761153. Xiong H, Li H, Kong HJ, Chen Y, Zhao J, Xiong S, Huang B, Gu H, Mayer L, Ozato K, Unkeless JC (2005). "Ubiquitin-dependent degradation of interferon regulatory factor-8 mediated by Cbl down-regulates interleukin-12 expression.". J. Biol. Chem. 280 (25): 23531–9. doi:10.1074/jbc.M414296200. PMID 15837792. Zhao J, Kong HJ, Li H, Huang B, Yang M, Zhu C, Bogunovic M, Zheng F, Mayer L, Ozato K, Unkeless J, Xiong H (2006). "IRF-8/interferon (IFN) consensus sequence-binding protein is involved in Toll-like receptor (TLR) signaling and contributes to the cross-talk between TLR and IFN-gamma signaling pathways.". J. Biol. Chem. 281 (15): 10073–80. doi:10.1074/jbc.M507788200. PMID 16484229. Huang W, Saberwal G, Horvath E, Zhu C, Lindsey S, Eklund EA (2006). "Leukemia-associated, constitutively active mutants of SHP2 protein tyrosine phosphatase inhibit NF1 transcriptional activation by the interferon consensus sequence binding protein.". Mol. Cell. Biol. 26 (17): 6311–32. doi:10.1128/MCB.00036-06. PMC 1592828 . PMID 16914719. Dimberg A, Kårehed K, Nilsson K, Oberg F (2006). "Inhibition of monocytic differentiation by phosphorylation-deficient Stat1 is associated with impaired expression of Stat2, ICSBP/IRF8 and C/EBPepsilon.". Scand. J. Immunol. 64 (3): 271–9. doi:10.1111/j.1365-3083.2006.01827.x. PMID 16918696. Leonard D, Svenungsson E, Sandling JK, Berggren O, Jönsen A, Bengtsson C, Wang C, Jensen-Urstad K, Granstam SO, Bengtsson AA, Gustafsson JT, Gunnarsson I, Rantapää-Dahlqvist S, Nordmark G, Eloranta ML, Syvänen AC, Rönnblom L (2013). "Coronary Heart Disease in Systemic Lupus Erythematosus Is Associated with Interferon Regulatory Factor 8 Gene Variants". Circ. Cardiovasc. Genet. 6 (3): 255–63. doi:10.1161/CIRCGENETICS.113.000044. PMID 23661672. Peng YB, Yerle M, Liu B (2007). "Mapping of nine porcine interferon regulatory factor genes.". Anim. Genet. 37 (6): 600–1. doi:10.1111/j.1365-2052.2006.01525.x. PMID 17121613. Huang W, Horvath E, Eklund EA (2007). "PU.1, interferon regulatory factor (IRF) 2, and the interferon consensus sequence-binding protein (ICSBP/IRF8) cooperate to activate NF1 transcription in differentiating myeloid cells.". J. Biol. Chem. 282 (9): 6629–43. doi:10.1074/jbc.M607760200. PMID 17200120. Mattei F, Schiavoni G, Borghi P, Venditti M, Canini I, Sestili P, Pietraforte I, Morse HC, Ramoni C, Belardelli F, Gabriele L (2006). "ICSBP/IRF-8 differentially regulates antigen uptake during dendritic-cell development and affects antigen presentation to CD4+ T cells.". Blood. 108 (2): 609–617. doi:10.1182/blood-2005-11-4490. PMID 16569763. Schiavoni G, Mattei F, Sestili P, Borghi P, Venditti M, Morse HC, Belardelli F, Gabriele L (2002). "ICSBP is essential for the development of mouse type I interferon-producing cells and for the generation and activation of CD8alpha(+) dendritic cells.". J. Exp. Med. 196 (11): 1415–1425. doi:10.1084/jem.20021263. PMC 2194263 . PMID 12461077.